In 2010, Bayard & Holmes declared Halloween to be Love-A-Spook Day. It is the day when we honor the remarkable unsung heroes of the Intelligence Community, without whom we could not hope to enjoy the benefits of this great nation. This year, our honoree is Distinguished Service Cross recipient Virginia Hall, who served with distinction behind enemy lines during WWII with the British Special Operations Executive and later with the OSS and the CIA. Image by US Govt., public domain. Virginia was born on April 6, 1906, to a wealthy family in Baltimore, Maryland. Having a gift for languages, she studied French, German, and Italian at Radcliffe College and Barnard College and then traveled to Europe to continue her education in Austria, France, and Germany. Virginia hoped that her language skills would allow her to enter the US Foreign Service. After finishing her studies in 1931, she was hired as a Consular Service clerk at the US Embassy in Warsaw. From there, she was assigned to a consulate office in Izmir, Turkey. While in Turkey, Virginia had a hunting accident and had to have her lower left leg amputated. She obtained a wooden prosthetic leg, which she named “Cuthbert,” and was then assigned to the US consulate in Venice. Virginia requested permission to take the US Foreign Service Exam, but she was informed that due to her injury, she could not apply for a position as a diplomat. She returned to the US and attended graduate school at American University in Washington, DC. In 1940, Virginia was visiting Paris when Germany invaded France. She responded to the invasion by volunteering with the French Ambulance Corps and driving ambulances to evacuate wounded French soldiers from the front. When France surrendered to Germany, Virginia escaped to Spain, and then on to England. In London, Virginia met Vera Atkins, a recruiter for British Special Operations Executive (“SOE”). The circumstances of that fateful meeting are not clear. Some sources say they met on a train while evacuating France, and others claim that they met at a party in London. Never one to avoid danger, Virginia applied for service in the British SOE and was accepted. Virginia trained in weapons, communications, and as a resistance organizer for occupied France. In August of 1941, she infiltrated Vichy, France. Some sources state that she was the first female SOE agent to do so. The US was not yet directly involved in the war, so Virginia posed as a news correspondent for the New York Post. Once the US entered the war in December of 1941, the sensible thing for her to do would have been to quickly make her way back to England. Fortunately for the allied effort, she declined to escape and went underground. When Virginia infiltrated Vichy, France in 1941, the Vichy Republic region was not yet occupied by the Nazis because the Petain government fully collaborated with the Nazis. At that time, operating in Vichy was more dangerous for an SOE agent than operating in the Nazi occupied region of France. The Vichy government had command of the French police departments, and with so many reliable local assets, it could more easily discover infiltrators and resistors. Most SOE agents sent into Vichy, France in 1941 and 1942 were killed or captured within days. Virginia clearly had the right talents, education, courage, and determination for her difficult work. She quickly earned a reputation as a great recruiter and resistance organizer in France. She was instrumental in the rescue of hundreds of downed allied aviators, and she arranged their safe return to England. She also organized a network of safe houses and coordinated numerous air drops of weapons and supplies to the French Resistance at a time when most drops were being intercepted by the Vichy police and the Gestapo. Virginia’s successes did not go completely unnoticed by the Vichy government and the Nazi Gestapo. The Gestapo branded her as the most dangerous spy in all of France, and they made her capture a priority. In November of 1942, most of the Vichy-controlled French colonial military forces in northwest Africa offered only token resistance to the allied landings in Morocco, Algeria, and Tunisia. The Nazis decided that the Vichy government was not collaborating to Hitler’s satisfaction, and they took over control of the Vichy Republic. Infamous Gestapo leader Clause Barbie demanded that “the woman with the limp,” as Virginia was known, be captured and brought directly to him so that he could personally strangle her. Virginia managed to stay one step ahead of the Gestapo, and that winter, she escaped on foot over the Pyrenees to Spain. During her trek over the snow-covered Pyrenees, Virginia radioed her progress to the SOE and mentioned that she hoped that “Cuthbert” would not give her too much trouble. The SOE officer that responded, apparently not in on the joke, messaged back that if Cuthbert gave her trouble, he should be “eliminated.” Fortunately, Virginia managed to keep Cuthbert in her service and made it to Spain, where she was captured by the Spanish police. After the US embassy learned of her internment, they claimed her as a legitimate US citizen and demanded her release. Virginia then began working undercover in Spain. After four months, she decided that she was no longer achieving enough, and she returned to England in hopes of doing more “useful” work. In 1943, England’s King George VI presented Virginia Hall with an Honorary Membership in the Order of the British Empire for her remarkable courage and successes. Though she could have accepted a position as an instructor or agent handler in England, Virginia left the SOE in order to join the fledgling American Office of Strategic Services, the OSS. Remarkably, she volunteered to return to occupied France. Virginia dyed her hair gray and disguised herself as an elderly farmer. Since her wooden leg made a nighttime parachute drop too dangerous for her, she was infiltrated back to Bretagne, France on a British torpedo boat. Using the alias “Marcelle Montagne” and the code name “Diane,” she made her way to central France, where she set up radio communications with London. In addition to transmitting intelligence back to London, Virginia again organized successful supply drops for the French Resistance, established safe houses, helped train three battalions of Free French guerilla forces, and linked up with a Jedburgh team after the Allied invasion. In spite of Clause Barbie’s personal vendetta against her, Virginia avoided capture and continued operating until the Allies liberated central France in 1944. 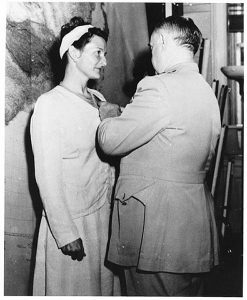 In September of 1945, on behalf of a grateful nation, OSS General William “Wild Bill” Donovan presented Virginia Hall with a Distinguished Service Cross. That was the highest honor received by any female civilian during World War II. 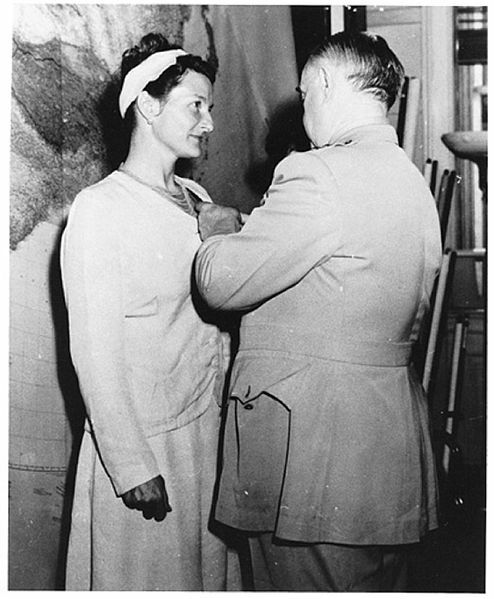 President Truman had intended to present her the award in a public ceremony at the White House, but Virginia insisted that the ceremony be kept from public view because she was “anxious to get back to work” and still needed her cover. She wasn’t finished yet. Virginia went to work undercover in Italy operating against Soviet efforts to cultivate Italian communist groups. Afterward, she worked with a CIA front group, the National Committee for a Free Europe, which was associated with Radio Free Europe. In 1950, Virginia married OSS Agent Paul Goillot, and in the following year, both Virginia and her husband joined the newly-established CIA. Virginia became an expert on resistance groups in Soviet-occupied Europe. She remained in the shadows and worked on a variety of projects until her retirement in 1966. Virginia Hall Goillot passed away of natural causes at Shady Grove Adventist Hospital in Rockville, Maryland, on July 8, 1982. To this day, her remarkable history of selfless service in the cause of freedom remains a shining example for the intrepid few who might dare to follow in her footsteps. 2011 post on Josephine Baker currently being added to a book.